The Rodgers & Hammerstein Broadway musical Carousel was turned into a movie in 1956 starring Shirley Jones and Gordon MacRae. The big song and dance number June Is Bustin' Out All Over features supporting players Barbara Ruick as Carrie Pipperidge and Claramae Turner as Cousin Nettie. The individual members of the Mixed Chorus are not identified. 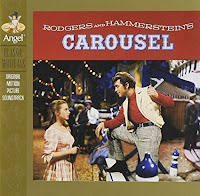 Carousel was the most significant film appearance by both women. Barbara Ruick was born Dec. 23, 1930 in Pasadena, CA the daughter of radio actors Melville Ruick and Lurene Tuttle. So not surprisingly Barbara started out in radio and then was under contract to MGM. In the 50s, she appeared on TV a lot. She was a regular on Hollywood Screen Test, The College Bowl, The Jerry Colonna Show and The Johnny Carson Show. She also appeared on a 1955 studio cast recording of the Gershwin musical Oh, Kay!. So when she was cast in Carousel, they knew she could sing but she wasn't much of a dancer. After Carousel, she married legendary film composer John Williams. She continued to appear on TV but less frequently. After playing one of the evil stepsisters in the 1965 TV production of Cinderella, Barbara retired and died on Mar. 3, 1974 at age 43. Claramae Turner was born Oct. 28, 1920 in Dinuba, CA which is in the desert. She sang with the New York City Opera from 1953-1969. So Carousel was her only film appearance. She retired in 1974 and died on May 13, 2013 at age 92. I'm sure opera fans know all about her. Carousel is available on CD with some bonus tracks. Here's Barbara Ruick, Claramae Turner and the Mixed Chorus performing June Is Bustin' Out All Over in the 1956 film Carousel.